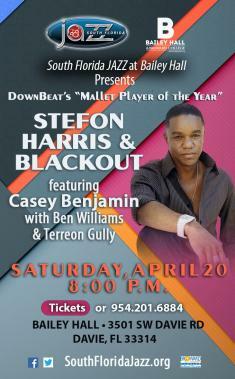 Saturday, April 20, 2019 at 8: South Florida JAZZ, the area's preeminent jazz society, presents Stefon Harris and Blackout, featuring saxophonist Casey Benjamin. Passionate artistry and astonishing virtuosity have propelled the Albany, New York native mallet player, Stefon Harris, to the forefront of the invigorated jazz scene. Following his bachelor's and master's degrees from the Manhattan School of Music, he has been heralded as one of the most important artists in jazz. In addition to his four Grammy ® nominations, he also is the recipient of the prestigious Martin E. Segal Award from Lincoln Center and has been named "Best Mallet Player" by DownBeat Magazine and the Jazz Journalists Association. He also has fared extremely well in other polls that have been dominated reflexively for so long by now-retired Gary Burton.